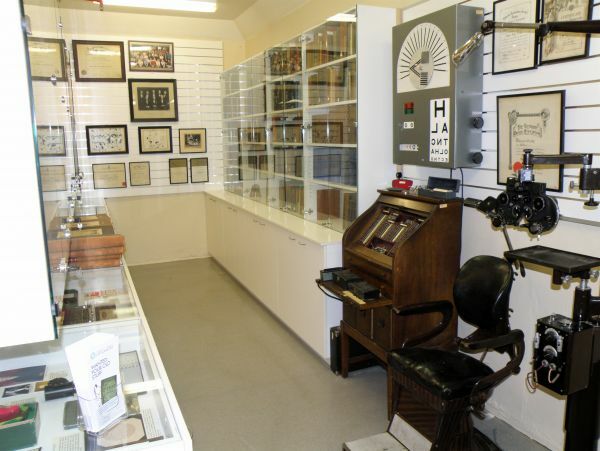 The Cyril Kett Museum and Archive contains books, instruments, spectacles, photographs, paintings, archival papers and objects relating to the history of optometry and optometric education. Items in the collection date from the 17th century. 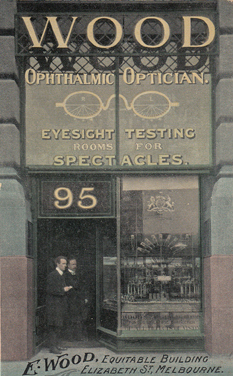 They provide insights into the changes and developments in optometry and ophthalmology over 300 years. Cyril Woodford Kett. Painting by John Nathan 1980. Cat No.8. 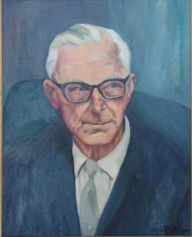 The Museum and Archive is named in honour of Cyril Henry Woodford Kett FBOA FSMC (1890 - 1970) who was one of the five people who signed the Memorandum and Articles of Association of the Australian College of Optometry in 1939. He was a councillor of the College from 1940 to 1970 and First Vice President 1944 to 1947. He was made an honorary life member of the College in 1954. He donated numerous items of historical interest to the College that provide the foundation of the Museum. The collection formally started in 1970. 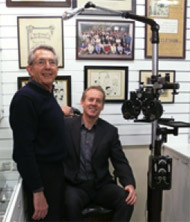 Sydney optometrist Robert Kaye (standing) donated a 1930s Bausch and Lomb ophthalmic chair and stand in 2009. 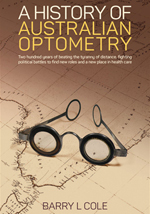 Bausch and Lomb paid for its transport to Melbourne. Bausch and Lomb’s Australian Manager is sitting in the chair. The museum welcomes donations of material of historical interest, be it books, instruments, personal papers, photographs, spectacles or spectacle cases, or memorabilia and ephemera. At present we are especially interested in spectacle frames and cases from 1950 to 2000, both the run-of-the-mill spectacle frames of this period and the more exotic and outrageous examples. If you are thinking of donating something to the Kett Museum you can check the catalogue to see if we already have the same or a similar item. Even if we do, the item you wish to donate may be in better condition, or, in the case of books, be an earlier edition. Items that have some special historical connection are of particular interest. For example books signed by the author or items that have been owned by an optometrist or vision scientist of particular note have added historical value. Contact the Librarian or one of the archivists by phone or email if you have an item you think might be worth preserving in the museum. The names of donors are recorded in the catalogue. Donated books (except books of high historical value) have a donation plate pasted inside the front cover to record the name of the donor and the date of donation.